These Terms and conditions(the "Terms") are intended to define the conditions and modalities of consultation and use of holiday-rentals.seaview-france.com, referred to herein as the "site", edited by VUE SUR MER ®, referred to herein as "VUE SUR MER". Simply access or use the Site constitutes acceptance by you of these Terms, you may are a homeowner or property manager (referred to herein as “Advertiser) or a potential renter (referred to herein as "traveller"). These general conditions are a translation of a French text available here in original version. In case of divergence, the French version is the only legally valid and shall prevail over any other version. 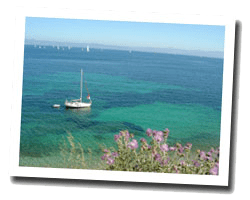 The site offers a selection of holiday homes with sea views all along the French coastline in the mainland and overseas. These holiday rentals are offered by various advertisers, including individual owners, estate agents, holiday villages, etc..
2. This site is a portal site. We are not involved in any transaction between travellers and advertisers. We do not own or manage, nor can we contract for, any holiday rental property listed on the Site. As a result, any part of an actual or potential transaction between a traveller and an advertiser are solely the responsibility of each user, including the quality, safety or legality of the properties advertised, the truth or accuracy of the listings, the ability of the advertiser to rent a vacation property, damage or misuse in the holiday rental or the ability of travellers to pay for holiday rental properties. We are also not responsible for the condition of the holiday rental properties listed on our Site or the compliance with laws, rules or regulations that may be applicable to any holiday rental property in any jurisdiction. This Site may contain links to other Internet sites. Links to and from the Site to other third-party sites, maintained by third parties, do not constitute an endorsement by us of any third parties, the third-party sites or the contents thereof. We are not responsible in any way for such third-party sites or resources and your use of such sites and resources will not be governed by these Terms. The User acknowledges that the Internet presents specific techniques that involve the inability to guarantee the absolute continuity of services, response times and security in data transmission. The User acknowledges that the Services provided will be interrupted for maintenance reasons, or cases of “force majeure” or beyond the control of SEA VIEW ®. Responsibility for SEA VIEW ® can not be held liable for malicious introduction or a hacking site. The responsibility of the site, its managers, directors and / or employees shall not be sought about quality or specifications of the products and services provided by Advertisers or about payment transactions made ​​in the context of relations between advertisers and travellers, or about direct or indirect damages such as loss of customer, legal action, any disturbance to business, liability, loss of brand image, loss of profits, etc..
7. Proprietary rights and downloading of information from the Site. The Site and all content on the Site are protected by copyright as a collective work and/or compilation, pursuant to applicable international copyright laws and conventions and database rights. You agree to abide by any and all copyright notices, information, or restrictions contained in or relating to any content on the Site. Copying, storing or otherwise accessing the Site or any content on the Site for other than for your personal, noncommercial use (other than in accordance with a valid subscription) is expressly prohibited without prior written permission from us. You agree that, with respect to other users' personal information that you obtain through the Site or through any Site-related communication or transaction, we have granted to you a license to use such information only for: (a) Site-related communications that are not unsolicited commercial messages, (b) using services offered through the Site, (c) facilitating a financial transaction between you and the other user (such as an on-line booking or charging a personal credit card) and (d) any other purpose that a user expressly agrees to after you tell them the purpose you would like to use it for. You may not use any tool or service on the Site to send spam or unsolicited commercial electronic communications of any kind or in any other way that would violate these Terms. We draw the attention of travelers about the risks of entering into any contract and the risks of Internet use. Each advertiser is solely responsible for the services, benefits, and information provided, including the photo of the holiday rental. we are not required to verify the information provided by the advertisers. According to case law, the responsibility of the site can not be held liable for errors or omissions in the corpus of ads. The information is to be confirmed when booking under the sole responsibility of the advertisers. The traveller recognizes its responsibility to verify such information before the conclusion of the contract. Travelllers are encouraged to follow the guidance provided in the renters pages of the site to ensure the compliance of advertising and the good faith of advertisers. Consequently, the traveller recognizes that the responsibility of VUE SUR MER ® can not be sought for the services or information offered, and accepts that their use is carried out under its sole responsibility. Regarding the ads provided by individuals owners, we can not confirm the claimed identity of each user. Some ads are provided by trading partners, including HomeAway, Pierre et Vacances, Belambra, Interhome, Atraveo, Nemea (not exhaustive). These ads fall within the general conditions of each partner. The quality charter VUE SUR MER does not apply to these ads. This agreement shall be governed by and construed in accordance with the french laws. The original version of this document is French. In case of conflict between the translation of this document and the original version, the french version shall prevail. The use of the Site is prohibited in countries where any parts of these Terms are invalid according to local law. In case of dispute concerning the use of the Site, and if no amicable settlement could not be established, the parties choose the district court of Nantes, France, as sole jurisdiction.